A long time ago I realized I didn’t have all of the answers. Its not that I didn’t try to have them all or at least give the impression that I had them all. This realization led me to looking to others who knew more than me. I found role models and mentors through books, in the organizations I was a part of and in my own family. Early on I wanted to be just like those I looked up too. And I do mean “just like them” – I practiced talking like them, wearing the same clothes, listening to the same music, doing my hair like them, watching the same movies and multiple other things. My aspirations became what I saw them succeed at. None of this was wrong, by seeing how other people “do it” we learn how to “do it”. Where I missed out though was in developing my own voice. Because I wanted, so much, to be like those I looked up too I spent a lot of time and energy on imitating and becoming a copy. I should have spent that time and energy on discovering my unique gifts, talents and voice. If we are to grow and mature we must have role models and mentors. Its essential for us to have those in our life that help us push forward, stretch and go beyond what we thought we could. A good role model and mentor helps you discover your uniqueness and equips you to speak with your voice. 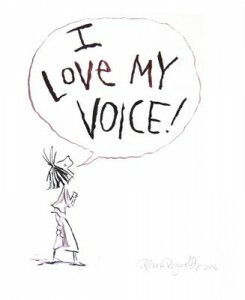 Have you discovered your own unique voice? How did you do it?